Beach Lane Books, 9781481403481, 40pp. Equipped with a map, boots, a walking stick, and a jaunty trail hat, a girl ventures from the rim of the Grand Canyon down to the Colorado River at the very bottom. In expansive block prints whose radiant colors and heroic characterizations recall vintage murals, Wolff (Baby Bear Sees Blue) portrays her intrepid heroine as confident and largely independent (while her parents accompany her, they remain background characters), in the midst of an adventure that’s every bit as grand as the setting’s name promises. Winding through billions of years of striated stone, the girl spots petroglyphs and mule trains, as well as majestic bighorn sheep, speckled lizards, and soaring condors. Scanlon (The Good-Pie Party) builds many couplets around the use of the contraction “here’s” (“Here’s a tree with roots in rock,/ and hello, Mr. Red-Tailed Hawk!”), creating the sense that readers are witnessing each sight or discovery right alongside the girl. Readers may well close the book demanding that the next family vacation takes them into the wild. A girl narrates in rhyming couplets the various sights she sees while hiking through Arizona’s Grand Canyon, including flora and fauna, park workers, and evidence of past human habitation. An abrupt change in setting on the last page shows the narrator in what appears to be her city bedroom, reflecting on her experiences. A note about the author’s experience visiting the Grand Canyon joins a glossary and a short list of websites as back matter. Wolff’s bold block print and gouache illustrations, featuring strong black outlines, are the highlight of this offering. Sweeping natural vistas, seen from a point of view just above the action, alternate with close-ups of the narrator and her ranger and animal companions. The large serif typeface, sometimes printed in black and sometimes in white, is easy for beginning readers to decode....VERDICT Purchase if the Grand Canyon is of strong local interest, or to add to a collection in need of easy to read geography picture books. The Grand Canyon? That nearly 2 billion-year-old, 277-mile-long, and 1-mile-deep "crevice" in northern Arizona? Never heard of it? 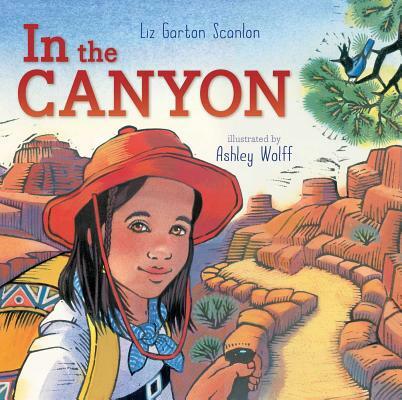 Well, grab a hat and backpack and follow an intrepid young hiker as she takes readers from the rim to the canyon floor while pointing out sights in sprightly, two-line rhymes. "The clouds come up, the wind blows in / the shadows fall upon hot skin." Wolff's linoleum-block prints colored in gouache meticulously detail native plants and wildlife amid the landscape. Warm tans, oranges, and yellows bring the magnificent canyon to life along with Scanlon's collegial, nature-guide commentary....Striking endpapers feature a double-page spread of popular canyon landmarks with a tagged California condor soaring in the foreground. The author's note and fact-filled glossary keep the story from bogging down while providing relevant historical and scientific information. Internet URLs are included for the National Park Service, Grand Canyon Association, and National Geographic. Nature lovers of all ages will welcome the easy accessibility of this Grand Canyon tribute. families, and an inspiring introduction to this miraculous, wild place.